Singapore Airlines (SIA) stories of stewardesses, stewards of more than 10 years by Boh Tong : Why no free water?? What do you expect...? just because its owned by SQ...?? For heaven's sake, its a budget airline...!! 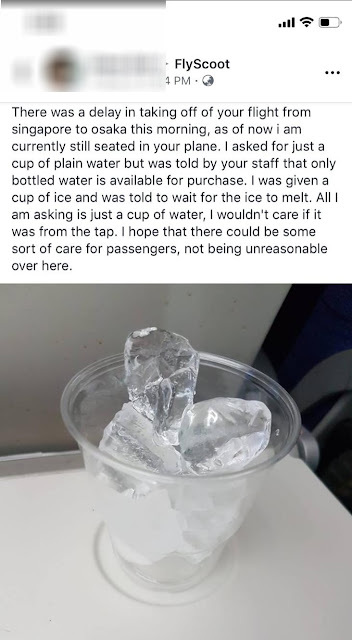 Damn lucky you were not charged for ice and the plastic cup! Air Asia would've done the same. If you want free, then bring your own. Sinkies love complaining for no good reason. If you really need water and they only have bottled water, then just pay for it! Dont be a cheapskate and say -its only water. They have been kind to give you ice and yet ungrates like you still kaopei like a typical loser sinkie. I am afraid is a common practice among budget carriers all over the world. At least they offered a glass of ice.